Taipei, Taiwan, September 10, 2007 – In line with AMD's announcement of the Quad-Core OpteronTM Processor, ASUS has launched the innovative KFSN4-DRE series server board and RS161-E5 server system with advanced design guidelines and equipped with the latest Dual Dynamic Power Management and Dual Link technology for leading-edge native quad-core performance, targeting at the High-Performance Computing (HPC) market and enterprise-class applications. The Quad-Core AMD OpteronTM processor is an industry-defining native quad-core microprocessor that continues AMD's tradition of energy efficiency, performance and virtualization leadership; through seamless upgradability from Dual-Core OpteronTM, these server products are specially designed for the new processor to reduce total operation cost. The ASUS KFSN4-DRE series are the first Dual Dynamic Power Management™ ready platform with front Parallel-Balance CPU and memory placement designed to increase thermal efficiency by up to 20 ~ 30%. The 16-DIMM 64GB memory scalability helps achieve the maximum AMD Quad-Core Opteron™ computing power and the optimal memory resource – increasing performance and efficiency for many virtual workloads of Virtualization applications. Powered by the AMD PowerNow!™ technology, ASUS' server platforms can help lower the total operation cost of datacenters or HPC server farms by reducing processor power consumption during non-peak workloads, thereby reducing heat generation and decreasing strain on cooling systems to protect investments in today's demanding server environments. The benefits of power savings are fully optimized on ASUS' server boards with Dual Dynamic Management™ that are designed with separate power planes for cores and memory controllers in order to obtain optimum performance at reduced power consumption. Furthermore, the Independent Dynamic Core Technology allows each core to be controlled individually for better power management, helping reduce power consumption as well. "Next-Generation Quad-Core AMD Opteron™ processors make an outstanding improvement in performance-per-watt. Dual Dynamic Power Management™ ready platform will have a significant performance gain and power-saving. 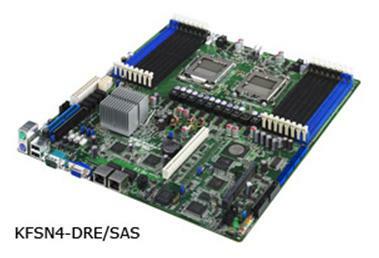 ASUS KFSN4-DRE series server board and the RS161-E5 server system are the optimal server platforms for supporting AMD Opteron™ multi-core processors." Along with the KFSN4-DRE server board, the upcoming ASUS RS161-E5 is ASUS' next-generation dual Opteron™ processor-based 1U server system. 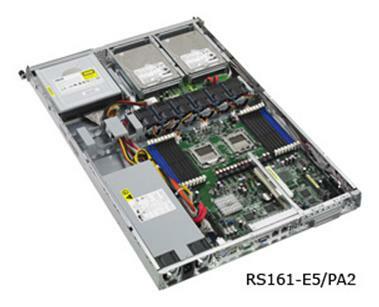 The rack-optimized placement delivers the best thermal solution and high scalability in a 1U form factor. Featured with ASUS' Smart Fan II Technology, the RS161-E5 can automatically adjust cooling conditions based on the system workload and ambient temperature – providing quiet working environments with less power consumption. Through the integration with the exclusive ASUS system management tool – ASWM and ASMB3-SOL, it will facilitate the manageability of the IT environment and reduce the TCO (Total Cost of Ownership).